Join a monthly careers evening hosted by Ten Years Time on careers in social enterprise and philanthropy. 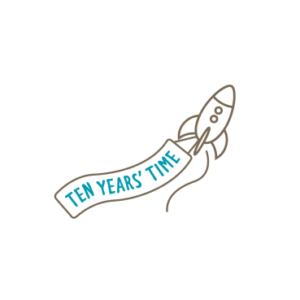 If you’re interested in finding out more about what we do and ways you could be involved, we advise coming along to one of our careers evenings or just pop us an email with a paragraph about you to careers@tenyearstime.com. We run the The Social Sector Taster Programme for those looking to get some project based work experience at one of the organisations at the Ten Years’ Time Hub, so please get in touch if you are interested in finding out more. We are also interested to meet people who might want to franchise the Ten Years Time model abroad or are interested in investing time or money to become a partner in the UK business.